Model size: 16.75" x 11"
Description: This large pennant-shaped sampler combines scenes from Arthurian legend and motifs from medieval art. A jousting scene, portraits of Arthur and Guinevere, and a vine-and-lattice border are all stitched over-one. 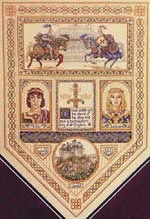 A circular medallion at the bottom of the sampler depicts Camelot, and the piece may be personalized with initials and date. A border composed of interwoven celtic-inspired motifs finishes the sampler. Background Information: I've always been fascinated by the legends of King Arthur, and by the history and art of ancient Britain. This piece is an attempt to bring some of those elements together into a viable whole: kind of a "collection of impressions". The quote in the central panel: "Whoso pulleth out this sword of this stone and anvil is the true-born king of all England", is taken right out of Sir Thomas Mallory's "Le Morte d'Arthur", and was, I felt, quite appropriate! Stitching Comments: If you like (I mean *really* like) over-one stitching, this piece is for you. And because much of the design uses that technique, there are very few blended floss colors. The main drawback with this leaflet is that the chart is a large pull-out sheet that is folded several times. It is, however, computer-generated, and easy to read. The specialty stitches used are uncomplicated.